Despite being an optimistic individual, I have the publishing industry blues these days. So do a lot of other writers, it seems. Manuscripts that would have sold a few years ago are languishing on hard drives. Authors that would have been snapped up by agents a few years ago are sending out yet another round of hopeful queries. And then there are myriad pieces like this one from The Guardian. I don’t want to get into self-publishing versus traditional routes here. Nor do I want to ferret out more links about the industry that cite statistics and opinions. What I want is to feel better. Wire to Wire, Scott Sparling's debut novel, was published by Tin House Books in June. 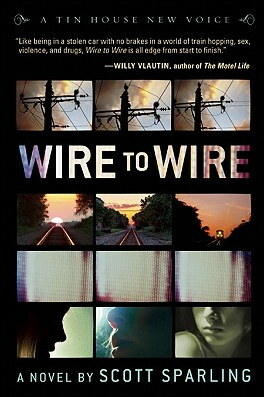 Interviewing Scott Sparling about his debut novel, “Wire to Wire,” definitely tops the list this week. It was great fun to realize we studied with Stevan Allred and Joanna Rose at the same time (although we attended different classes). We’re all brother/sister writers, and whenever one of us succeeds, it’s a wonderful thing to celebrate. So hurray for Scott! Wire to Wire has received rave reviews. If you’re looking for your next book, go out and buy this adrenaline-fueled, literary feast of a crime novel. Yuvi Zalkow recently announced exciting news over on his blog. He’s the brains behind the hilarious “I’m a Failed Writer” presentations, and guess what? The self-proclaimed “failed writer” now has an agent and a book deal! I couldn’t be happier for him–and thanks, Yuvi, for once again putting a smile on my face. You can read the details here. While on my writing retreat in southern Oregon, I had the great pleasure of meeting the community’s writer-in-residence, Jessie van Eerden. Her book, “Glorybound,” is slated for publication next spring by Wordfarm. Although her website is still under construction, check out the page on “Glorybound” to learn more and read some impressive pre-release blurbs of her book from Gina Oschner, David James Duncan, Kevin Oderman and Patricia Foster. Liz Scott, a member of my regular critique group, launched the Pocket Shrink blog this week with her coauthor, Bridget Harwell. The two practicing psychologists are working on a nonfiction book of short essays, and the blog is an extension of that collaboration. Go check it out. Their posts are personal and thought-provoking, much like their beautiful essays. Something that made me grin this week was this post by Jo Eberhardt over at The Happy Logophile, where she talks about how I surprised her by subscribing to her blog in its infancy. Jo’s a prolific and always interesting blogger. With her first 100 posts, she’s done an incredible job building community, sharing links to other blogs, increasing her subscriber base and even being Freshly Pressed. Congrats on reaching that milestone, Jo! So, writers, what’s your good news? It can be anything–your own good news or somebody else’s, how many words you wrote today, your latest epiphany about your novel, or whatever you want! Just bring on the positivity, OK? This entry was posted in Community, Fiction, Writing and tagged Jessie van Eerden, Liz Scott, publishing, scott sparling, Wire to Wire, Yuvi Zalkow. Bookmark the permalink. 29 Responses to OK, Writers: What’s Your Good News? Perhaps we ought to do regular positivity posts to keep each other sane. Hmm… I guess that means we all have to keep collecting good news! You have every right to squeal, Emerald! You’re most welcome, Yuvi! I can’t tell you how thrilled I am about your deal. I absolutely can’t wait to buy a copy of your novel. And get it signed at a reading. Hey–have you thought about signing books while standing on a desk? Well done and well timed, as today I got a rejection from a publisher I really thought would like my book. I’ve already self-published it and was offering it to him (and I’d stop pub’ing). He seemed to think I should only offer ‘fresh’ material. Any rejection, no matter the reason, is depressing. Thanks for the cheer. Oh thanks for stopping by, Jacqui! I’m glad that these good tidings came along when you needed some positivity. Rejections are so hard, especially when you’re especially excited about that agent or editor. I’m avoiding the whole scene these days by sitting on my finished novel and pouring my time into the work-in-progress, but that isn’t a great strategy. I really do believe in that book and need to get it circulating. It seems easier to keep working on the new one, though. This particular book I have already self-pub’d, which I cleared with the publisher before submitting. Their rejection cited that as the reason. I am discouraged because I thought they were a perfect fit, but my annoyance takes a bit of the edge off. Allow me to encourage you to get that finished mss out. Agents are nice, publishers too, but if not them you can self-pub. Such a great option these days. That’s so frustrating, Jacqui, especially because you OKed the submission in advance. And thanks for the encouragement. I do need to get that manuscript out there. 1) I got through the hurricane with no damage, and while I was stuck indoors I got some good writing done. Then I had ice cream. 3) I’m making good progress on my WIP and getting great feedback from my readers. Two new chapters are coming along well. Oh, and my friend who just wrote a paranormal YA romance has interest from a top agent. No offer of representation yet, but the signs look very positive. And even more good news! Excellent! I hope your friend gets signed and will be sending good vibes that way. Hurray for good news! Congrats on surviving the hurricane–and having the good sense to have ice cream on the premises to celebrate. And yay for positive feedback about your novel. As for “sitting on” my finished novel–hee hee! Thanks for your comment, Emma! Congrats on re-establishing your writing time now that you’re back on a work schedule. I hope the transition continues to go well! My pleasure, Bridget! I love what you and Liz are doing with Pocket Shrink. Hi, Laura! Let’s see…my good news is that I won a short story contest recently. Pretty jazzed about that. Oh, and I just finished reading Chuck Wendig’s “Confessions of a Freelance Penmonkey,” which has me excited about the next round of revisions on my novel-in-progress. For what it’s worth, that Guardian article is crap. The idea that people will suddenly stop liking really, really good books – or that they’ll stop paying for things they like – is almost charmingly naive. I kind of want to write a blog post, now, about just how ridiculous that is. Whoo hoo, Brian! Tell us the details–which story contest and what’s your story titled? Being excited about your revisions is a joyful thing, too. I agree about the Guardian article and other like-minded doom and gloom pieces about the end of books. But people keep writing and publishing those articles, and they can be rather unsettling, especially to those of us who keep writing books! Thanks for stopping by, Brian. I’ll check out that website. Updated to add: Oh that’s wonderful! Everyone should look at the link Brian posted. Wow, that’s wonderful, Brian! And I’ll have to bookmark Agent Courtney. I agree about the Guardian piece. It smooshed some different things together to make its points. That’s what happens when you start with your point and then try to come up with facts to support it, rather than starting by looking at what’s actually going on and seeing what points come out as you go. I spent the last three days writing like a maniac and nobody came in and stopped me. That is my good news. Publishing is not the only thing suffering these days, and I think great books have been getting rejected since the beginning of print. I still see people reading softcovers in cafes and on buses. I still see book stores with mellow employees and friendly cats and dogs. I say we all keep writing. I agree, Tamara! 100% and congrats on not getting interrupted! Good point, Tamara, about how great books have been rejected many, many times in the history of printing. Let’s all keep writing–and reading and supporting authors and patronizing mellow bookstores. My local one has a cat.